Written by Mosaica's Laura Kolkman and Bob Brown, the "Health Information Exchange Formation Guide" received the HIMSS Book of the Year Award. 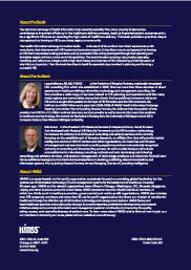 The book provides a practical step-by-step approach for planning and establishing an HIE. It is based on the authors' own direct experiences as HIE consultants, their interviews with HIE leaders, and extensive research. Included are numerous tables, figures, illustrations and checklists that take the reader through the process of successfully establishing an HIE. 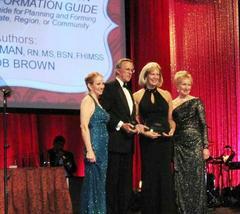 Laura Kolkman and Bob Brown receiving the HIMSS Book of the Year Award at the 2012 HIMSS Awards Banquet in Las Vegas.